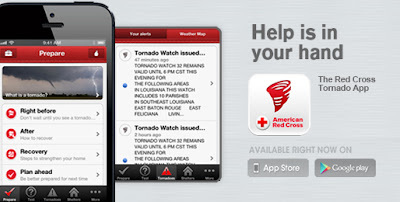 Get your family and home ready for a tornado with the official Tornado App from the American Red Cross. The tornado warning app puts everything you need to know to prepare for a tornado – and all that comes with it – in the palm of your hand. With interactive quizzes and simple step-by-step advice it’s never been easier to be ready. From your mobile phone, call "**REDCROSS" (**73327677) and we will send you a link to download the app to your phone or you can download them directly from the iTunes orGoogle Play app stores. Simple step-by-step instructions to help you know what-to-do even if the cell towers and TVs are down. Prioritized actions for before, during, and after requires no mobile connectivity. Help distant friends and family in tornado alley with ability to receive tornado watch and warning alerts based on their location from the National Oceanic and Atmospheric Administration. Be ready should a tornado hit by learning how to assemble an emergency kit for your family in the event of power outage or evacuation. Reduce your household’s stress and anxiety should a tornado hit by learning to make and practice an emergency plan. Interactive quizzes allow you to earn badges that you can share with your friends and show off your tornado knowledge. Know how many tornadoes have occurred in your area. Know the difference between a tornado warning and a tornado alert. Let others know where you are with the Toolkit’s stobe light, flashlight and audible alert functions.